Luanda – 17 years ago, I visited the Jesuits in Angola. 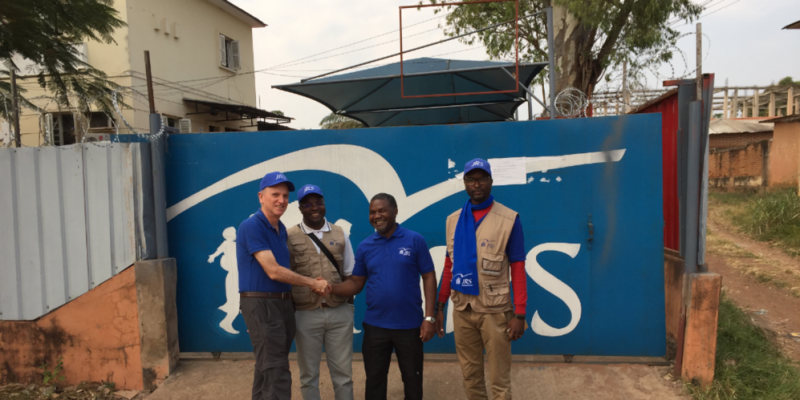 On our way to a retreat house site outside Luanda, we stopped at Viana, a rural area where JRS was working with refugees from Rwanda and Congo and Angolans displaced by civil war. 17 years later, I visit Viana again. In 2018, Viana is now part of sprawling Luanda, a poor, mixed community of Angolans and refugees. JRS is still there. We accompany the Rwandans who remain. Those who could have gone have long gone. In Viana, a few hundred of the 4,500 Rwandans who lost refugee status by government fiat two years ago—are overwhelmingly elderly, overwhelmingly poor, with tuberculosis, HIV infection, and mental illness all part of the picture. They cannot go home, because those who drove them to Angola in the first place still rule Rwanda. Stripped of their legal status, odd jobs and hand-to-mouth existence are the norm. We try to meet immediate needs there, and we do not always succeed. I visit a bank of small rooms, perhaps 10 in all. JRS offers the rooms to elderly refugees who have no one else to care for them. When they die, JRS pays the burial costs. The waiting list is long, the rooms rarely empty. We meet with the community for an hour in a government-owned centre we want to renovate. We hear stories of hunger, lack of work, insurmountable health issues and bills. We shake hands with those present, we do our best to listen, JRS staff follow up on some medical bills. They are happy to see us, and there is no talk of what will happen next. I have to admit that language of outputs and outcomes can roll off my tongue. I like visiting classrooms, reconciliation meetings, chatting with staff about programmes that change people’s lives. I am a believer in the Reign of God being built here on earth. In the weathered faces of Viana’s elderly, talk of that reign of God would be a lie. It is the JRS mission to accompany the most vulnerable, the most forgotten. None of us is asked to do “the best,” but rather, the best we can. Jesuit theologian Jon Sobrino has said that Jesus is alive in the poor, and it is our job to take the poor down from the cross. Yet sometimes, the Reign of God is to stand at the foot of the cross; wait, pray, offer what we have. Such is Viana, and that is why JRS is still there.